With 400,000 copies sold, this accessible, bestselling picture book phenomenon about the unbreakable connections between loved ones has healed a generation of readers--children and adults alike--and has been updated with new illustrations and an afterword from the author. Now available in paperback for the first time! Parents, educators, therapists, and social workers alike have declared The Invisible String the perfect tool for coping with all kinds of separation anxiety, loss, and grief. In this relatable and reassuring contemporary classic, a mother tells her two children that they're all connected by an invisible string. "That's impossible!" the children insist, but still they want to know more: "What kind of string?" The answer is the simple truth that binds us all: An Invisible String made of love. Even though you can't see it with your eyes, you can feel it deep in your heart, and know that you are always connected to the ones you love. Does everybody have an Invisible String? How far does it reach? Does it ever go away? This heartwarming picture book for all ages explores questions about the intangible yet unbreakable connections between us, and opens up deeper conversations about love. 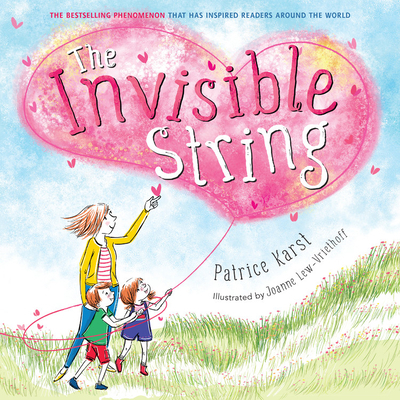 Patrice Karst is the author of The Invisible String and The Smile That Went Around the World. Her adult books include God Made Easy and The Single Mother's Survival Guide. Born in London, England, she now lives in Ventura, California, and is the mother of one grown son. She invites you to visit her online at patricekarst.com. Joanne Lew-Vriethoff is the acclaimed illustrator of many children's books including the new edition of The Invisible String and the Invisible String Workbook, as well as Stacy McAnulty's Beautiful and Brave. Born in Malaysia, she grew up in Los Angeles, studied at the Art Center College of Pasadena, and now lives in Amsterdam. Her website is joannelewvriethoff.com. "[Promotes] a vision of global unity and empathy...effective." "Whether kids are having separation anxiety or dealing with divorce or even death, this sweet story is very reassuring."